As a holistic veterinarian and animal advocate with 22 years of experience and thousands of hours of research under my belt, I’ve concluded that dry food is not a fit diet for our cats and dogs–carnivores who need a meat-based diet. I constantly try to make the case against feeding dry food. But it’s really a hard concept to get across to people. Against me are the convenience and relatively low cost of dry food; and those are powerful opponents. In this article, I’ll give you 10 reasons why dry food is so very bad for pets so you’ll understand why, if you want optimal health and long life for your pet, dry food isn’t going to get you there. Dry food is typically made from rendered ingredients, such as chicken meal, poultry by–product meal, and meat and bone meal (MBM). Rendering starts with animal-source ingredients being fed into a massive grinder to reduce them to chunks. The resulting hodgepodge is boiled at high temperatures for hours or even days, turning everything to mush. Fat floats to the top and is skimmed off for other uses. The remainder is dried to a low-moisture, high protein powder suitable for use in dry foods. Because all of this ends up as an amorphous brown powder, it’s impossible to know what went into it. However, the U.S. Food and Drug Administration (FDA) found that dog foods containing MBM and/or “animal fat” (both rendered ingredients) were the most likely to contain pentobarbital, the primary drug used to euthanize animals. In some dry foods, such as those found at grocery stores, discount stores, and large pet supply stores, even rendered meat is too costly to make the needed profit, so manufacturers substitute rendered by-product meals and/or vegetable proteins such as corn gluten meal, soybean meal, and plant protein concentrates to get the protein up to minimum acceptable levels. Other ingredients of the dough include carbohydrates, or starch (either grains or starchy vegetables), a vitamin-mineral premix, and water. Adult dogs and cats do not need any carbohydrates in their diet; all these starches do is provide calories. Because they aren’t a natural part of our carnivorous pals’ diets, most of those calories are quickly converted to fat. And then veterinarians wonder why we have a “pet obesity epidemic”! Cost isn’t a reliable indicator of quality, although extremely cheap foods are bound to contain extremely cheap ingredients. The manufacturer has to buy ingredients, process them, bag and ship the finished food to a distributor, and at the same time pay for labor and overhead. Then the distributor stores the food and ultimately delivers the food to retail outlets. Those stores charge for shelf space to keep themselves in business. And yet, the food may sell for $1.50 a pound, while guaranteeing a profit for everyone along the way! The cost of all the ingredients in a $1.50/pound food can’t be more than 30 cents/pound. And if the manufacturer also promotes the food through expensive advertising, that cost has to be deducted, too. A survey of dry cat food for sale at a popular internet pet site found a huge variation in the price and quality. As expected, generic and grocery-store type dry cat foods were less than $2.00 per pound, while “organic” and many “grain-free” foods were more in the $3.00/lb. range. But the most expensive foods were not grain free, organic, or natural; but rather were those most massively (and expensively) advertised. Science Diet’s Feline Indoor Maintenance rang up at an astonishing $3.96 per pound, despite containing not one single shred of real meat (mainly poultry by-product meal, rice, and corn). Don’t even ask about Hill’s Prescription Diets—but if you just gotta know, their “hypoallergenic” z/d formula is over $6.00/lb. To make dry food, whatever rendered high-protein meal is being used is mixed into a sticky, starchy dough that can be pressed through an extruder, which forms the kibble. The dough is forced by giant screws through a barrel and ultimately into tiny tubes that end in a shaped opening, much like a cake decorator. The heat and pressure in the extruder are tremendous. As the compressed dough exits into the air, it passes through a whirling mass of sharp knives that cuts the pieces individually as they “pop” when they reach normal air pressure, creating the familiar shapes associated with each pet food brand. While heat processing makes vegetables, fruits, and grains more digestible, it has the opposite effect on proteins. Not only are cooked proteins less digestible, but they become distorted, or “denatured,” by heating. These abnormal proteins may be a factor in the development of food allergies, as the immune system reacts to these unfamiliar and unnatural shapes. Enzymes, special proteins that aid in thousands of chemical reactions in the body, are especially fragile, and are rapidly destroyed by heat, even at relatively low temperatures. The normal food enzymes that would help digest the food are destroyed by the heat processing that dry food undergoes. This forces the pancreas to make up for those lost enzymes. Over time, the pancreas can become stressed and enlarged, and even get pushed into life-threatening pancreatitis. Carbohydrates are molecules that contain carbon (C), hydrogen (H), and oxygen (O) —carbon and water (H2O) —in other words, “hydrated carbon.” The simplest carbohydrate is sugar; and all carbs are varying configurations of sugars. Fiber is a special type of carbohydrate made by plant cells to keep their cell walls rigid, allowing plants to grow upright from a relatively small base. It takes a special enzyme (cellulase) to digest fiber that dogs and cats do not have. Dogs and cats are carnivores, meat-eaters. Their natural diet is high protein and high moisture. For example, a whole rat contains about 8% carbs. Natural prey (birds, rabbits, rodents, etc.) contain from 9-10% carbs. Most of this consists of glycogen, the storage form of sugar that the body stores in the muscles and liver; and some comes from undigested food in the prey’s gut. The carnivore’s ideal diet is essentially the Atkins diet: lots of protein and fat, and a small amount of complex carbohydrates from vegetables. The average carb content of dry cat food is about 30% carbohydrates; but it ranges from 8% in EVO Cat and Kitten food (the carbs are replaced by 44% protein and an astronomical 47% fat), to 48% in Blue Buffalo Lite. Protein is the most expensive ingredient, and carbs the cheapest; so in general (but clearly not always! ), cheaper foods contain more carbs. While classified as carnivores, dogs (and humans) are, in practice, omnivorous, meaning they can use pretty much any food as fuel. They use carbs directly for energy by breaking them down to simple sugars. Sugars not needed for immediate energy, or to replenish glycogen stores in the liver and muscles, are turned into fat. This takes place through several biochemical pathways; but a major pathway used by most mammals (involving the enzyme glucokinase) is essentially absent in the cat. Strictly carnivorous cats preferentially use protein and fat for energy, and these pathways are mandatory. Felines can digest and absorb carbohydrates, but those carbs mostly turn quickly and directly into fat. Another disadvantage of carbohydrates is that they have a high glycemic index; this means that they raise blood sugar higher and faster than other nutrients. Increased blood sugar triggers the release of the hormone insulin from the pancreas. Insulin allows sugars to be absorbed into cells, where they can be used for fuel. Without insulin, no matter how fuel-starved cells may be, sugars stay in the bloodstream. Heat processing increases the glycemic index of carbohydrates. Corn—a common ingredient of dry food—has a glycemic index similar to a chocolate bar. 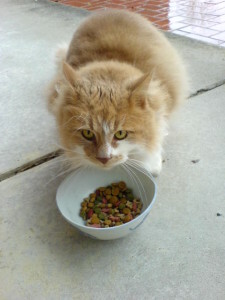 When dry food is available all the time, cats in particular will nibble at it 15-20 times a day. This causes multiple sharp swings in blood sugar and requires the pancreas to secrete insulin each time. Over-secretion of insulin causes cells to down-regulate and become resistant to insulin. This is one reason why dry food is a major contributor to feline (Type II) diabetes. While dry food does not directly cause diabetes in dogs, it does contribute to metabolic syndrome, a pre-diabetic condition. The pancreas also secretes bicarbonate to neutralize the acid in food coming from the stomach. Continual pancreatic stimulation also creates an alkaline environment in which urinary crystals and stones can easily form. It’s currently estimated that more than 50% of dogs and cats in the U.S. are overweight, and many are seriously obese. Carrying extra weight isn’t cute or cuddly—it will shorten your pet’s life, create unnecessary discomfort, and will surely lead to one or more chronic diseases, such as diabetes, bladder and kidney disease, arthritis, liver failure, chronic gastrointestinal problems, poor immunity, and even cancer. You’re not doing your pet any favors by giving in to those big eyes, and those even bigger appetites, which are in most cases caused and perpetuated by dry food. Obviously, dry food is dry. This is a very big problem for cats, whose ancestors are desert-dwelling wild cats. They have passed on their super-efficient kidneys, which are designed to extract every last drop of moisture from prey animals. As a result, cats have a low thirst drive, and don’t drink water until they are about 3% dehydrated—a dehydration level so serious that most veterinarians would consider giving intravenous fluids. Dogs have a higher thirst drive and will drink more readily, so they are less prone to serious dehydration. Dehydration causes or contributes to many serious health issues, including urinary crystals and stones, bladder infections, FLUTD, constipation, and kidney disease. Given the types of things manufacturers put in pet food, such as pesticide-soaked grains and diseased, dead, and dying animals, it is not surprising that bad things sometimes happen. Ingredients used in pet food are often highly contaminated with a wide variety of toxic substances. Some of these are destroyed by processing, but others are not. • Bacteria & bacterial toxins. Slaughtered animals, as well as those that have died because of disease, injury, or natural causes, are sources of meat, by-products, and rendered meals for pet food. Rendered products commonly found in dry pet food include chicken meal, poultry by-product meal, and meat and bone meal. Animals that die on the farm may not be transported to the rendering plant for days after death. These carcasses can be heavily contaminated with bacteria such as Salmonella and E. Coli released from the decomposing digestive tract. Dangerous E. Coli bacteria are estimated to contaminate more than 50% of meat meals. While the rendering process kills bacteria, it does not eliminate the endotoxins some bacteria produce during their growth. These toxins can survive processing, and can cause sickness and disease. Pet food manufacturers do not test their products for bacterial endotoxins. In addition, flavorings such as “animal digest” that are sprayed onto dry food can easily become contaminated with Salmonella, as numerous recalls and human illnesses have proven. In 2012, Salmonella sent 49 people to the doctor after they simply touched dry pet food. • Drugs. Because sick or dead animals are frequently processed for pet foods, the drugs that were used to treat or euthanize them may still be present in their meat and organs. Penicillin and pentobarbital (the euthanasia drug) are just two of the drugs that can pass through processing unchanged. Antibiotics used in livestock production also contribute to antibiotic resistance in pets and people. • Mycotoxins. Toxins from mold or fungi are called mycotoxins. Modern farming practices, adverse weather conditions, and improper drying and storage of crops can contribute to mold growth. Pet food ingredients that are most likely to be contaminated with mycotoxins are grains such as wheat and corn; and fish meal. There have been many large pet food recalls in response to illness and death in pets due to a very powerful poison, called aflatoxin, in dry food. More than 100 dogs have been killed by this toxin by contaminated dry food. • Chemical Residues. Pesticides, herbicides, and fertilizers may leave residue on plant products. Grains that are condemned for human consumption by the USDA due to residue may legally be used in pet food. The USDA does not even test for glyphosate, the active ingredient in Monsanto’s Roundup®, so there may be any amount of it in either human or pet food! • GMOs. Genetically modified plant products are also of concern. As of 2015, 95% of the planted area of soybeans, 88% of cotton, and 95% of corn in the U.S. were genetically modified varieties. Corn in particular is heavily contaminated with glyphosate. Cottonseed meal is a common ingredient of cattle feed, as are soy and corn. Soy and corn are also used directly in many pet foods. A 2010 study found significant damage to the liver and kidneys of rats fed genetically modified corn, as well as an increase in tumors. Unless corn is specified to be organic, it is almost certainly loaded with glyphosate. • Acrylamide and other Maillard Reaction Products (MRPs). These carcinogenic compounds form at cooking temperatures of about 250˚F in foods that combine certain sugars and the amino acid asparagine (found in large amounts in potatoes and cereal grains). It forms during a chemical process called the Maillard Reaction. Most dry pet foods contain cereal grains or starchy vegetables such as potatoes, and they are processed at high temperatures (200–300°F at high pressure during extrusion; baked foods are cooked at well over 500°F). These conditions are perfect for the Maillard reaction. In fact, the Maillard reaction is desirable in the production of pet food because it imparts a palatable taste, even though it reduces the bioavailability of some amino acids, including taurine and lysine. The amount and potential effects of acrylamide and MRPs, many of which are toxic) in pet foods are unknown. Preservatives are not needed in canned foods since canning is itself a preserving procedures. Dry food manufacturers need to ensure that dry foods have a long shelf life (typically 12 to 18 months) to remain edible through shipping and storage, fats used in pet foods are preserved with either synthetic or “natural” preservatives. Synthetic preservatives include butylated hydroxyanisole (BHA) and butylated hydroxytoluene (BHT), propyl gallate, propylene glycol (also used as a less-toxic version of automotive antifreeze), and ethoxyquin. For these antioxidants, there is little information documenting their toxicity, safety, interactions, or chronic use in pet foods that may be eaten every day for the life of the animal. Propylene glycol, which is what keeps semi-moist food and “bits” soft and chewy, is banned in cat food because it causes anemia in cats, but it is still allowed in dog food. Potentially cancer-causing agents such as BHA, BHT, and ethoxyquin are permitted at relatively low levels in pet and some human foods. The use of these chemicals in pet foods has not been thoroughly studied, and long term build-up of these agents may ultimately be harmful. Ethoxyquin has never been tested for safety in cats. Despite this, it is commonly used in well-known veterinary “prescription” diets. The liver is first in line to receive all the blood returning from the digestive tract. That’s because the liver is a major detoxifying organ, with enzyme systems in place to intercept and dismantle many potential poisons. Large numbers of white blood cells also reside in the liver, ready to attack invading organisms. The liver is also responsible for making many proteins, such as albumin; it makes cholesterol, the base molecule for important hormones; and it produces bile, which is essential for digestion and absorption of fats. Cats’ livers are particularly sensitive to dietary changes. If a cat does not eat, the liver gets stressed and starts calling for “reinforcements.” In the cat’s case, this consists of fat breakdown around the body, which the liver then grabs from the blood stream and packs into its cells. This extreme fat hoarding can become so serious that it prevents cells from functioning properly, and a life-threatening type of liver failure, called “hepatic lipidosis” (fatty liver disease) can result. Overweight cats, and cats eating mostly or only dry food, are most at risk. You may have heard that 80% of the immune system is found in the gut. While that isn’t quite accurate, huge numbers of white blood cells do live in groups (“Peyer’s Patches”) along the intestinal lining. That makes sense, since the gut is one of the primary routes of entry into the body for invading organisms, from viruses to worms. As mentioned briefly above, the high-heat processing that dry food undergoes during manufacturing can denature proteins, meaning that it distorts their shape. To a protein, shape is everything, and only a protein in the correct shape will function properly. Shape is also how the immune system identifies proteins that belong in the body (“self”) versus foreign proteins. Viruses, bacteria, fungi, and other invaders are all identified by the proteins found on their surfaces. When an immune cell identifies a foreign protein, a whole cascade of signaling for reinforcements and production of antibodies is set into motion. Antibodies then scour the bloodstream looking for invaders matching their shape; when they find one, they latch on and signal for support. Inflammation is one of the primary responses. When an abnormal protein is picked up by an immune cell and antibodies are produced, then every time that protein appears, antibodies flock to it and stimulate inflammation. More bad proteins = more inflammation. The gut doesn’t take kindly to this reaction, and will start rejecting the food one way or another: vomiting, diarrhea, or both. Cats seem to be especially good at vomiting, and indeed, vomiting is the primary symptom of food allergies, as well as full-blown inflammatory bowel disease. A true food allergy is different from a dietary intolerance—though the symptoms may be the same. An allergy involves the immune system, while an intolerance may simply be a reaction to something in the food—one of the colorings, texturizers, or other additives. Allergies are generally to proteins; but there are proteins not only in meat, but also in soy, corn, wheat, and other grains. Both food allergies and dietary intolerances are more common with dry food. Fortunately, they both respond to dietary therapy. Both dogs and cats can develop inflammation, crystals, and stones in their bladders and kidneys. These conditions are exacerbated, if not outright caused, by dry food. Crystalluria – This is a condition where mineral crystals form in the bladder. There are many types of crystals in dogs, but only two are common in cats: struvite (also called magnesium-ammonium-phosphate), and calcium oxalate. Male cats who block usually have crystals that are held together in a matrix with mucus from the irritated bladder. This “plug” can slither down the urethra, where it can become stuck where the urethra narrows at its end. Urolithiasis – A “lith” is a stone, and of course “uro” means it’s in the urinary system. Only about 20% of LUTD cases involve bladder stones—about half of these are struvite, and half are calcium oxalate stones. They form most easily when the urine is very concentrated, which maximizes the chances of the components—which are all normally in urine—banging and sticking together into crystals or stones. Struvite stones can be dissolved by temporarily feeding an acidifed veterinary diet (the canned version, please! ), but calcium oxalate stones must be removed surgically. Dogs also get cystitis, crystals, and stones. However, in dogs, these conditions are far more likely to be caused by bacteria, partly because so many dogs must hold their urine for many hours while their guardians are at work or school. The urinary system’s natural defenses include urine flowing through and washing bacteria out along with it. When urine is held, bacteria have many hours to colonize the bladder and start causing havoc. The best way to prevent all bladder problems is to keep lots of fluid flowing through the urinary system to flush these problem particles out. The dehydrating quality of dry food produces highly concentrated urine that is much more likely to form crystals and stones. Wet food is needed to keep the urinary tract healthy; and it’s essential in any dog or cat with a history of bladder disease. To give your pet the moisture and protein content that are so necessary for good health, try canned, homemade, or raw food. Even though canned food is processed, it’s cooked only once (briefly at lower heat), rather than twice at high heat for dry food (once when the animal products are rendered, and again during extrusion). Canned food also tends to have a much higher protein content than dry food. Homemade food is ideal, if you are following a balanced recipe. [Warning: most “cookbooks” and recipes on the internet are NOT balanced, and can cause serious harm over time.] When you make your pet’s food, you are 100% in control of the quality of the ingredients, and you can add additional supplements depending on your pet’s individual needs, rather than getting a “one size fits all” commercial pet food. Raw meat based diets can be made at home, or purchased frozen or freeze-dried. Even just adding a little raw meat to any commercial diet will be an improvement. However, raw meat is always contaminated with bacteria, and may even harbor worms and other parasites. Dogs and cats are quite resistant to Salmonella, Campylobacter, and other common meat contaminants; and parasite eggs and cysts can be rendered harmless by freezing at -4oF for three days before using. For Dr. Jean’s best-selling ebook “What Cats Should Eat” (including an updated list of Dr. Jean’s recommended brands by name), please visit our Bookstore or Amazon.com. For our canine pals, “Paleo Dog” has information not only on diet, but also lifestyle: holistic health care, vaccination, and much much more!